As the song goes, It’s the Most Wonderful Time of the Year! I love this time of year, especially at night. Driving by homes and seeing the amazing light displays and Christmas trees with lights in the window make for such wonderful drives. Like most towns and cities across the US, if you jump in your car and just drive you are bound to see some sort of Christmas lighting that will catch your eye! The Christmas light displays on homes, business and even lining town streets are sure to make your commute home more enjoyable! If you’re wanting to see homes decorated just jump in your car and take a drive. 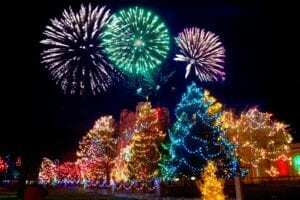 If you’re wanting to see major light displays, most of which are put on by regular folks like you and I and some by professionals! Check out the list below for some of the displays in the area! 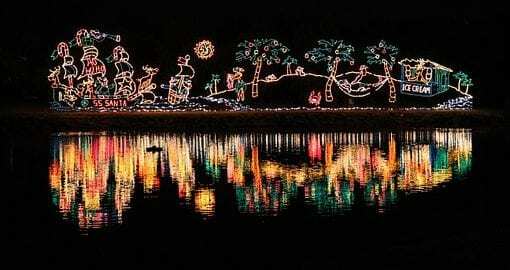 In addition to spectacular lighting displays some locations have other activities such as visits from Santa and hayrides. Some of these spectacular lighting displays are synchronized to Christmas music and you can set your radio to the station to enjoy the display with music! Pack up your family and head out and explore the magnificent lighting displays this year. Additional Information: There is a Santa train you can ride and an old-fashioned candy store and visits from Santa as well! Hours: Be sure to check their website listed below to make sure there are no changes in hours. **Weather permitting! Check website if there is any rain/snow in the area! Tickets: No reservations necessary! Tickets can be purchased online (see website below) or at the farm. -Santa’s Sweet Shoppe – Offering old-fashioned Christmas candy, hot chocolate, coffee, kettle corn and wonderful Smores kits that you purchase and cook yourself at the picnic area. -Christmas Hayride – A one-mile long, 30-minute old-time tractor-pulled hayride through a beautiful Lights Extravaganza, filled with Christmas music and holiday magic. -Sugar Barn – Cookie decorating station. Choose and buy different cookies cut outs to decorate. Kits include cookies, decorations, icing and packaged to take home. Hours: Runs through December 29th. Friday and Saturday 4:00 PM to 10:00 PM. Additional Information: Be sure to check out their website for everything they offer but to highlight a few they also have. A covered Wagon Hayride through the lights, bonfires, hot chocolate, S’mores and apple cider! A giant slide, corn house and a train ride (additional cost). Additional Information: Tune in to 90.3 FM to hear music that synchronizes with the lights! 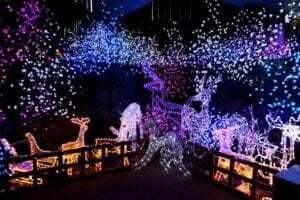 These are just a few of the many spectacular lighting displays in the area this season! Is there one we didn’t mention? If so, leave us a comment below! What’s Going On In Wake Forest?